I didn’t come back to reach 600 homers," said Sosa, when asked what motivated him to return to baseball after a one year hiatus. "I'm looking for more than that. I'm looking for 700 home runs. When it comes to homers, I'm a greedy person." This attitude helped “Slammin’ Sammy” crash through the 600 Home Run barrier…and keep right on going. 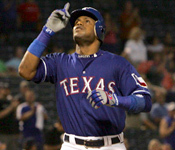 The landmark homer came on June 20th, 2007, while playing for the Rangers against his former team the Chicago Cubs, for which he hit 545 of his 609 home runs). 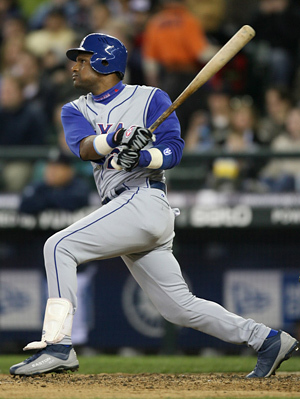 Sosa hit a 5th inning pitch from Jason Marquis (who happened to be wearing the number 21 jersey formerly worn by Sosa himself) far into the stands, becoming only the fifth man in history , after Hank Aaron, Barry Bonds, Babe Ruth, and Willie Mays, to hit 600 home runs. The truth of the matter is that Sosa has been EVERYWHERE before…and he has the homers to prove it. By hitting his 600th homer off of Marquis of the Cubs, he became the first player in league history to have a home run against every baseball team. Sammy finished his one-year farewell tour with 609 Super-size home runs, matching his bigger than life persona and providing a suitable ending to his career.